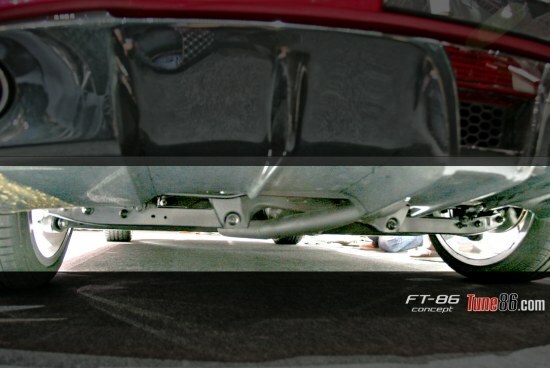 Here are photoshop enhanced pictures from the FT86 concept underside - rear diffuser, exhaust, differential, rollbar and suspension arms visible.. The FT86 G Sports concept edition seems to wear adjustable coilovers ;) click to zoom..
Weird exhaust location, probably too lazy to make exhaust over subframe for concept purposes. Diff is rather high (which brings up a question wether the concept was driveable at all, or they got an electronic model when they revealed FT86 at Tokyo Motor Show (the engine sound didnt convince me)? Other than that looks like the current standard Subaru subframe, wishbone & control link suspension. Here is a bigger photo of the rear suspension. Click to zoom for full size! yay the differential! hope its LSD for the base model! Restoring hachiroku, always in progress. Beaverboy: Not just the GR. 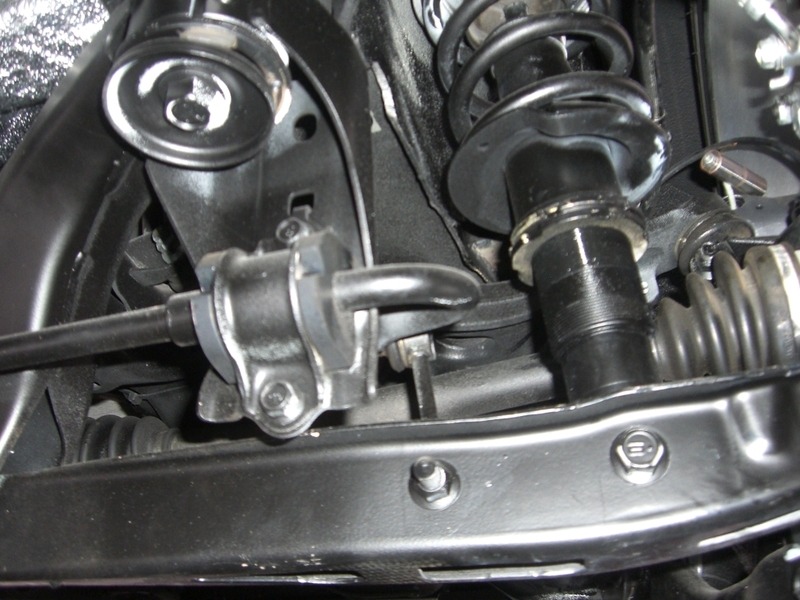 The '08+ Impreza and '09+ Forester use the same rear subframe and suspension arms. The GR just uses different knuckles. The lower arms on the FT86 look identical to the Subaru setup... 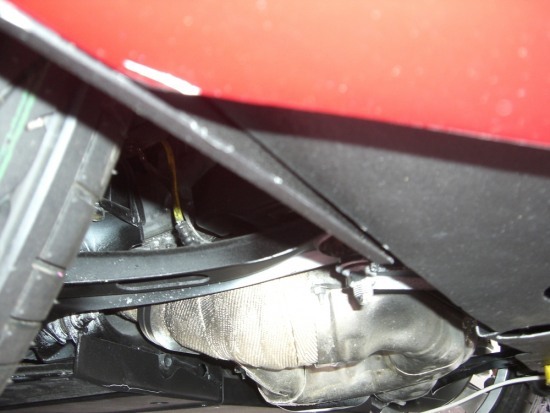 There's just a plastic cover across the lower part of the rear subframe giving it that asymetrical look... Which was probably done to hide the diff. 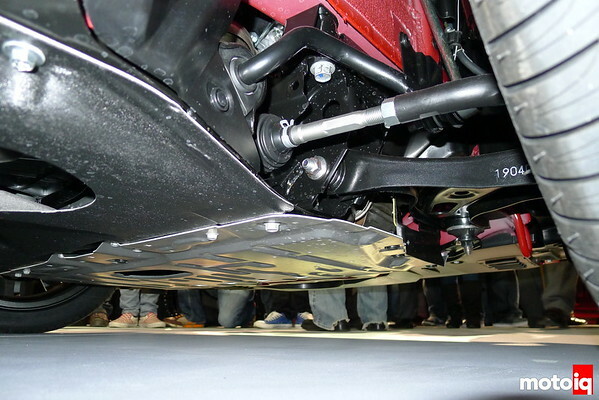 The new rear suspension has a better camber curve and bump compliance than the old Chapman struts, but there are no camber adjustments from the factory and Subaru insists on using a rediculously long bumpstop that limits useful travel. Fortunately the aftermarket has addressed nearly every issue. TIC is supposed to be working on a performance toe curve adjustment. the springs are about the same place too..
of course were talking about the FT-86 concept model that`s been quickly chopped together for the shows..
as the scooby gurus speak..
TougeRenner: Is it me or does it seem like where the ALK would normally go on those control arms is actually towards the front of the car instead of the rear like in traditional Subaru suspension? Beaverboy: Yup. It looks like they just kept the same front cradle from the NA Impreza and flipped the front control arms around. I doubt the production car would be built this way. If I'm wrong, some chassis braces and a [url=http://www.powerflex.co.uk/product-details/AL+%26+Caster+ADJUSTABLE+Fron... 'ALK'[/url] (ALK is a bit of a misnomer) is going to be the hot ticket for fixing up the steering. It wouldn't surprise me a bit if they use sube suspension. Good news is there is plenty of aftermarket. disappointed to not get the G Sport. I might have to move to Japan. The great thing about the FT-86 is that since it is a collaborative effort between toyota and subaru, parts for it will not be hard to find. I'm sure toyota coil springs can be installed there without any problem as much as a subaru one. It's a shame that development seems to have halted due to the tsunami but I hope this is more cost-effective than the LFA. Suspension looks exact the same on Toyota 86 and Subaru BRZ except those numbers..
mounts are indestructible, but there's no adjustment there. control arm bushing just below the steering arm. No such luck. traditional Subaru things with it. EVO car magazine drove the 86 and they say there is a Torsen LSD in the back, yay! Everything you wanted to know about Toyota 86 / Scion FRS / Subaru BRZ suspension! Our 2013 Scion FR-S is destined to have new parts thrown at it during its year with us. This may be the first time it finds itself perched on our Rotary 2-post lift, but it will certainly not be the last. With that in mind, let's consider this early 2013 Scion FR-S suspension walkaround to be a historical documentation of its pristine "before" state. What sort of starting point did the Toyobaru mash-up give us? And I suppose it goes without saying that everything we'll see on the following pages applies more-or-less equally to the new 2013 Subaru BRZ. Any suspension tuning differences that exist will be pretty much invisible. MacPherson struts prop up the front end, which is no surprise considering that's what it says on the spec sheet. Here the lower control arm (yellow) shows itself to be a simple one-piece steel stamping. Meanwhile, this drop link (yellow) connects the 18mm front stabilizer bar directly to the strut housing for maximum efficiency. 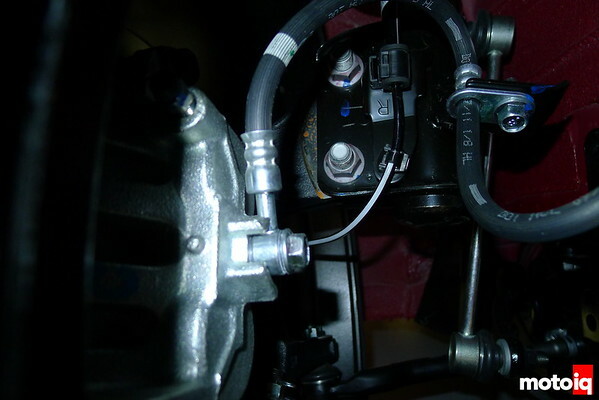 So-called rear-steer is necessary here because the Subaru H-4 boxer engine has a cylinder head (white) blocking the pathway to front-mounted steering. Also, if you've heard the FR-S or BRZ described as a "front-midengine" car, the person who said so is misinformed. Here you can clearly see that a good chunk of cylinder head sits ahead of the front axle centerline. The engine can't go any farther back because the rear-mounted steering needs a place to live. Besides, even if the motor was far enough back to qualify I despise the term "front-midengine" and consider it so much marketing BS and revisionist history. Keep the discussion focused on what matters -- weight dsitribution -- and I'll listen. On that front our 2013 Scion FR-S measures 55-percent front/45-percent rear on our own scales. Meanwhile, efforts to keep weight down and the front end of the car super low have resulted in a forward-facing lower control arm (yellow) and a simple crossmember (green) instead of a full perimeter subframe. A rear-facing structure (orange) braces the crossmember and carries the pivot bushings for the stabilizer bar. This view shows how an H4 boxer cylinder head (white) acts as an impenetrable barrier that blocks the way for front-acting steering. It also shows how the Scion's rear-mounted steering rack's input shaft (yellow) prevents the engine from being located any farther back. Meanwhile, the steering rack lacks any hoses, pipes or wires and looks 100-percent manual. Since this car has electronic power steering (EPS) and we don't see any evidence of that here, that can only mean one thing. And that thing is this: the 2013 Scion FR-S and Subaru BRZ use column-mount EPS. This is the area immpediately under the dash, just above the pedals. It's a pretty small module, which isn't a big surprise, I suppose, because this unit does not overpower the steering overmuch and take away all feel. Since the steering rack itself is truly manual, I wonder what it would feel like (apart from heavy parking effort) if this were removed and replaced with a straight shaft for zero assist on the track? The number of warning lights that would result on the dash would be truly alarming, I suspect. No point in trying that experiment, I think, because this steering feels pretty good right out of the box. A coil-over spring is nothing new where MacPherson struts are concerned. This one differs in that the springs are skinny and concentric with the shock so they can fit in behind the wheel and tire. Typical sedans and crossovers have offset springs with lower springs seats that hover over the top of the tire. That approach allows for higher capacity springs and makes room for the usual transverse engine but demands a tall fender. Just like the case of the Porsche 911 and Cayman, the use of an inboard strut/spring layout here on the Scion FR-S and Subaru BRZ makes a very low hoodline possible. Here's something you've never-ever seen on a Scion: the front hub is not connected to a drive axle. I'm not sure if this is a Subaru first, too -- they've been around a lot longer -- but I can't remember a recent example. On the subject of recovering Subaru purity with an AWD version of the BRZ, forget it. The engine would have to sit several inches higher and farther forward in order to give the drive axles a suitable place to poke out of the transmission, at which point we'd have a Subaru Impreza. 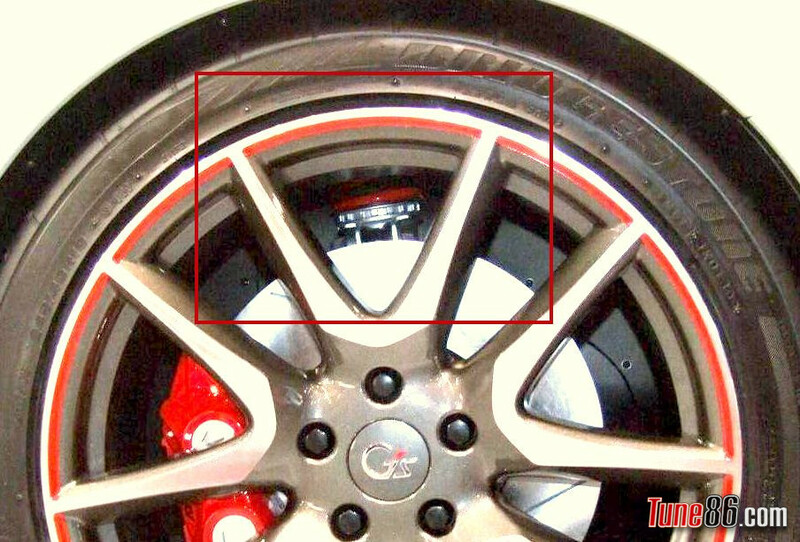 As for the brakes, we can clearly see dual pistons built into the sliding front calipers. The calipers contain the first of many instances of the word "Subaru" cast or stamped onto the underside of our 2013 Scion FR-S. I can't remember seeing the Scion or Toyota logo anyplace. Incidentally, those brake rotors are ventilated cast iron units measuring 11.7 inches in diameter. Up top, a pair of stress bars reinforces the shock towers and triangulates them with the firewall. We can't help thinking that this layout also leaves room for a Subaru top-mount intercooler and hood scoop. Just sayin'. No, the underside of the engine is not usually this exposed. I removed a broad undertray that was held on with about a dozen bolts and a handful of clips to get this view of the front suspension crossmember, oil pan and exhaust system. As you can see, a broad heat shield covers the exhaust manifold that spans the car and collects exhaust gasses from each bank of cylinders. From there it feeds through a series of two catalytic converters (yellow) before it heads for the transmission tunnel. Note to DIY oil changers: it's probably hot down here for quite awhile after you shut off the engine. Scion and Subaru call this a double wishbone rear suspension, but we can only see the upper wishbone in this view. And we can only see the upper one from this angle, too. This is not a double wishbone rear suspension, despite what the initial Scion and Subaru press kits may say. Well, I guess we could say there are two wishbones if we count one from the left and one from the right, but that's not how the game is played. We've already established there is an upper wishbone (yellow); that makes one. But down below there are two independent lower links (green), each with it's own bushing and pivot axis. There's also a short toe-control link (white) that is parallel to the main lateral link. While the two lower links may approximate a lower control arm in spirit, they are not a single piece and do not share a common ball joint or pivot axis. Two discreet links like these do not add up to a wishbone. They just don't. As of this writing, Scion and Subaru have not yet responded to my inquiry about their use of the term "double wishbone" on their spec sheets. I suspect a translation problem somewhere along the line. 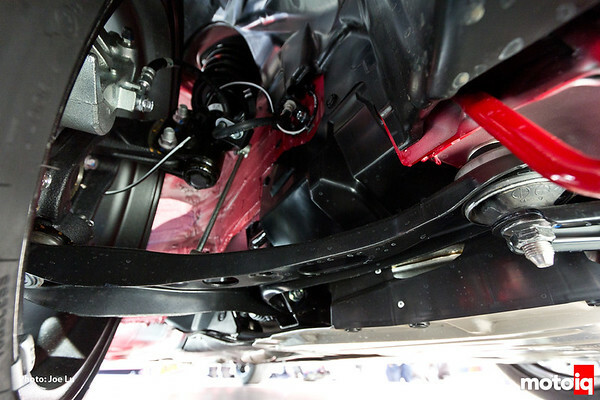 And so the 2013 Scion FR-S has a multinlink rear suspension that employs a single uppper control arm and a trio of (aka multiple) links. Not that there's anything wrong with that, of course. No matter what you call it, the suspension that Scion/Subaru has fitted back here is quite good out on the road. 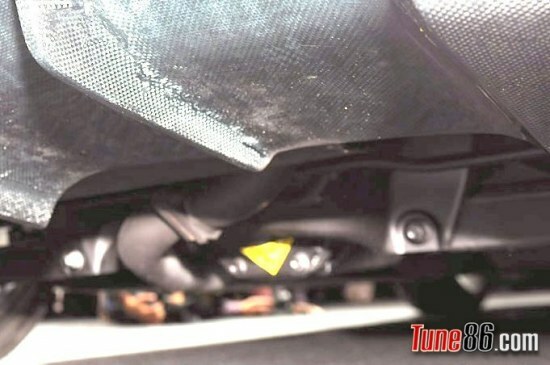 Here's another view of the Scion FR-S and Subaru BRZ multilink rear suspension: upper wishbone (yellow), toe link (white), two lower links (green). Another view of the same bits from a different angle. You've probably noticed by now that all the main bits are steel. The car's isn't meant to be expensive and its small size helps keep unsprung weight in check by the mere fact of its tidy dimensions. Still, more could be done. I guess that's what the aftermarket is for. Here's a series of isolated views of the parts, starting with the upper wishbone. You can just make out the inner pivots and the subframe they attach to under the lip of the red unibody. The toe-link has an eccentric cam at it's inner end (yellow) for easy static toe-in adjustment. This view shows that toe link eccentric (yellow) fron another angle. What is doesn't show is an eccentric at the inner end of the main lateral link (green) for camber adjustment, because there isn't any. Yes, it seems there's no factory provision for camber adjustment on a car that's likely to be lowered, modified, slalomed and otherwise track-driven by enthusiasts around the world. The aftermarket has already filled this void. The beefy main lateral link carries most of the important vertical and lateral loads. The FR-S's 14 mm stabilizer bar conects close to the middle at something like a 0.55-to-1 motion ratio, while the coil-over spring and shock assembly attaches farther outboard at 0.75-to-1 or thereabouts. 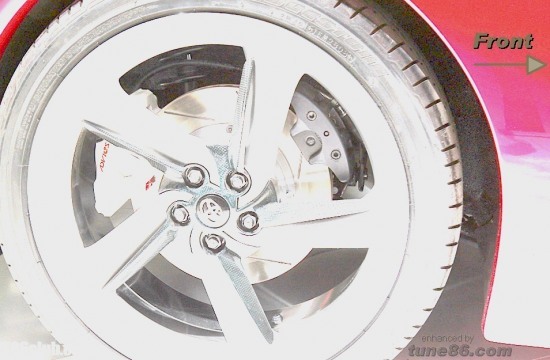 Rear braking is handled by a single-piston sliding caliper and 11.5-inch ventilated cast-iron rotors. The prominent hat section indicates the parking brake is a secondary drum brake hidden inside. That's a Torsen limited slip differential right there. It hangs from four bushings, with the rear pair separated into distinct functions: the right one supports it in the vertical direction and the left one regulates side-to-side motions. The FR-S rides or 215/45R17 Primacy HP summer tires that come straight off the Prius options sheet. The US-spec Prius doesn't offer them because summer tires are taboo on mass-market cars here in the US. But they do exist in other places, such as Europe, so the FR-S was able to parts-bin them. They're not high-performance summer tires by any means--they've got smallish tread blocks and numerous grooves to supress noise. Still, they work surprisingly well right out of the box. Any effort on Scion's part to make something more exotic may have been wasted, because they know that a large number of FR-S buyers are simply going to bin whatever the car comes with and buy something wider within the first month anyway. The mounted assemblies are not terribly heavy at 40.6 pounds apiece. Those of you shopping for wheels may want to know that the stock ones are 17-by-7 inches with 48mm of offset. There seems to be room for more tire under the Scion's fenders, which have lips that feel like they're pre-rolled in the most critical area.